Going against Mary Hightower's wishes, Nick, "the chocolate ogre", is slowly trying to reach every kid in Everlost to hand each and every one a coin, which will release them from Everlost. 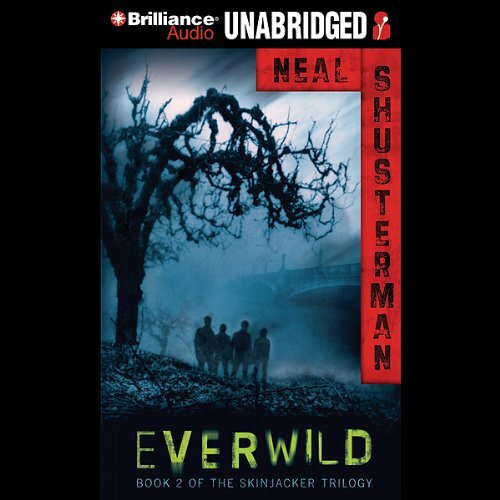 Mikey McGill and Allie have joined a band of skinjackers who have more of an impact on the living world then any other inhabitant of Everlost. Except Mikey can't skinjack and Allie can - and there is a very good reason. Allie is not actually dead. I love the characters in this story and the skinjacker series. I recommend this to anyone who enjoys the fantasy of unexplored worlds. Would you listen to Everwild again? Why? This is a very nice story with an interesting twist. Written for younger audience, but fun for older people too. This guy has the perfect voice and tempo for this book series. Thanks, Nick. Yes, I always wanted to know what happens next. Sadly, I couldn't listen without interruptions. yes, great story and kept my son of 12 years interested and he found it to be funny at times. I listened to the first book and felt the adolescent story was interesting, but I should have stopped there. Neal Shusterman continues the story begun in "Everost" and what a lovely wild ride it is! I was touched by the gentle romance in this story and yet shocked at times by the actions undertaken by some of the characters. Nick, Allie, Mikey, Mary, Milos, Zin and Jackin Jill are unforgettable spirits in this haunting tale. Shusterman's gift for character development and world-building just gets better and better. I think the narrator is one of the best, too. I recommend this book to everyone...but start with Everlost! I've been reading other reviews about this book, hundreds of them. Most of the reviews praise the book's brilliance. Did I even read the same book as these reviewers? I've read (or listened to) a handful of Shusterman's books. I gave them all five stars. He has quite an imagination. A good storyteller. That is why Everwild was such a huge disappointment. I liked Everlost but didn't really like the character of Mary, who was way too creepy for my taste. No problem since she was a villain and only appeared occasionally. This book had way too much Mary and not enough of the Nick and Allie who we'd grown so attached to in book 1. The points of view for this book were all over the place. The subplots were all over the place. I felt like I was the skinjacker. Allie and Nick were a disappointment. They were so strong and clear minded in Everlost; in Everwild, however, they were useless. I never understood the purpose of Milos. First he likes Allie, and then he likes Mary. It's like Shusterman didn't know himself who to hook him up with. Nick wasn't much better, vowing to destroy Mary even though he kind of, sort of loved her. Ugh. Halfway through, I still intended to give it a 3-star. But it just kept going downhill. In fact, the whole storyline went way past unbelievable and straight to ridiculous. Yes, I know it's fiction. But GOOD fiction can seem believable no matter how unlikely the situation. I held out, though, because I had high hopes that the ending would make up for my incessant boredom and irritation. Unfortunately, the ending was consistent with the rest of the book--confusing, erratic, and inconclusive. Everlost should have been a stand-alone novel, not a trilogy. I look forward to Shusterman's other books, but I don't think I can suffer through another skinjacker sequel.